See the information below on some of the lots/sub-divisions available now. These lots/sub-divisions are identified on the map to your right to give you their approximate location. If you don’t see the area or sub-division you would like, give us a call, there are still many other sites available to us. “Click” here for links to many of the Central New York area school district websites. "Click" on the community name below to see more! This was a 3 lot subdivision and 2 are already sold in just a few months. If your looking for a 5 acre lot in the Baldwinsville School District with natural gas and public water, and nothing ever behind you, don’t hesitate! Located on the north side of Doyle Road between River Road and Route 370 close to the new Baldwinsville YMCA on River Road. This community is located off River Road between Route 31 & Route 370 with a Baldwinsville address. It’s close to the new YMCA on River Road. This is very desirable area! Only two lots left, both being an acre or more. This sight is next door to South Meadow and is an extension of the South Village Community. There are still a couple of nice lots left here. Less than a mile from the Village of Cazenovia center sits this beautiful new subdivision. It adjoins the South Village subdivision, but with larger lots. A 3.3-acre park and a 6.5-acre conservation area will make this a very desirable area. This site has so much to offer been building out fast. a Brewerton address but in Onondaga County and close to everything! All public utilities, large lots and on the Oneida River. Over a mile of walking trails. A great place for young and seasoned citizens! Great neighborhood camaraderie. Some nice lots still available in Section III and Section IV is opening soon! Act now as there are already several deposits in on the new Section IV opening in June. Located in Lakeport on a beautiful setting. A boat dock is included with the lot and is maintained as part of the homeowner’s association which also provides for homeowner’s insurance, some maintenance, etc. all at a very reasonable cost per year. This development is part of the Chittenango School District. Located in Bridgeport at the site of the old Fisher Bay Marina. Some waterfront lots are available on the basin. Boat docks are available. Just minutes from Syracuse. This development is part of the Chittenango School District. This site and Buckley Woods are small subdivisions on Buckley Road, just north of Taft Road, across the street from one another. They both have a North Syracuse address in the CNS School District. Buckley Meadows is a 4 lot subdivision with lots ranging from over ½ acre to 1.3 acres. If you’re looking for a convenient homesite close to North Medical Center, restaurants and shopping, a lot here may be for you. This site and Buckley Meadows are small subdivisions on Buckley Road, just north of Taft Road, across the street from one another. They both have a North Syracuse address in the CNS School District. Buckley woods consists of 4 deep, 3/4+ acre wooded lots. If you’re looking for a convenient homesite close to North Medical Center, restaurants and shopping, a lot here may be for you. The 6th and final section of this popular neighborhood is already 2/3 filled but some of the nicest lots are still available! Great location and a great place to raise a family! This is a new subdivision that just came on line summer of 2017. All the lots are almost an acre or more. It’s located north of Route 31 on Morgan Road in the CNS School District. They offer public water and a nice country setting. Some lots are sloped which will offer Daylight windows in the basement for those who would like to take advantage of that area for family rooms, bedrooms and theaters. This was the site of the June 2016 Parade of Homes. A 26-lot sub-division that was originally Section 18b of the popular Mallards Landing sub-division. This is now a condominium association which gives the homeowner a 37% property tax break! If your taxes would normally be $10,000, they would now be $6,700 under the condominium association. These lots are going very quickly and will be sold out before you know it! It’s one of the areas fastest selling subdivisions. Give us a call to learn more how the condominium association works! Summit Meadows is a brand new section of Crown Point and will be just as popular as it’s predecessors. Just being the sight of the “2018 Parade of Homes” will certainly help keep up its popularity. A beautiful setting, close to SU, the hospitals and downtown doesn’t hurt either. This sub-division is just north of the center of the Route 31 shopping district on Dell Center Drive. A convenient location for shopping, access to Route 481, and Seoule Road. Many nice lots are available at reasonable prices. There are 12 acres of green area, a community garden and walking trails. This brand new sub-division was just completed and is now ready to pull building permits. Large lots ¾ acre to 2 ½ acres with public water and natural gas, just north of Wetzel road on Morgan Road in the Liverpool School District. Lock in your lot pick now! Located in Camillus between Canal Road and Rolling Hills Road. Large 2 acre lots are selling fast. Natural gas and public water, requires standard septic system. Walk-out basement capable! Located off Howlett Hill Road near the intersection of Onondaga Road. Lot sizes range from ½ acre to over 2 acres. All lots have public water, sewer, and natural gas. The site was scheduled to be opening in late Fall 2017. There are 4 lots already reserved so act quickly to select your favorite lot! This neighborhood is off Devoe Road in Camillus and is almost all built out. Just 2 lots left, both over an acre. They have public water, sewers and natural gas. Not many sights offer lots this large with all public utilities. Worth a look! This neighborhood is off Devoe Road in Camillus just across the street from the Viewpoint Community. Itand is almost all built out. Just 2 lots left, both over an acre. They have public water, sewers and natural gas. Not many sights offer lots this large with all public utilities. Worth a look! This upscale neighborhood is off Route 173, West of Route 11 (Salina St.) near the Community Campus of Syracuse University. 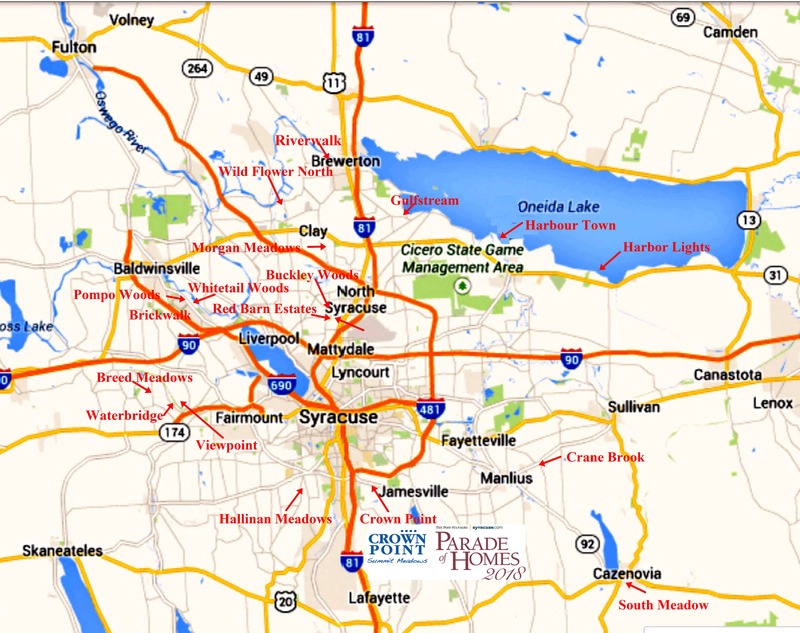 It’s location is convenient to Syracuse hospitals and universities. This popular and beautiful community has all public utilites on 1/2 acre lots. Build on your own lot or land! Click here to learn more about buying and building on a lot or land that you own or are looking to buy.